Superfluous parquet floor tiles like the one in the photo are being ‘sold’ at R500 each to bring the Franschhoek Theatre project to completion. 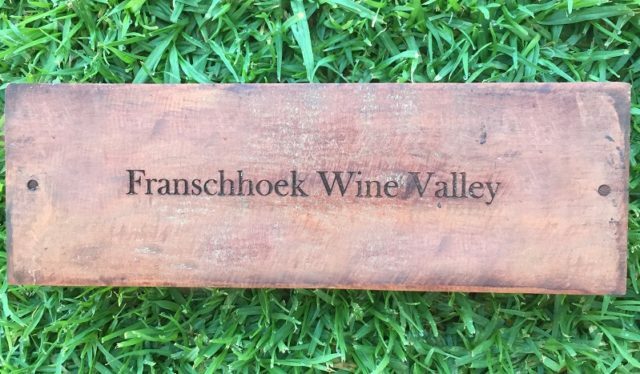 If you haven’t yet bought a wooden parquet tile in support of the Franschhoek Theatre Project at Franschhoek High School your time could be running out. The project team says that sales are brisk and an ever-decreasing number remain to be sold. As part of the final fundraising push a limited number of teak parquet tiles are being sold. The tiles, original to the historic building, are superfluous to the theatre’s flooring needs as some previously parqueted areas are being carpeted. Some of these superfluous parquet tiles are being ‘sold’ at R500 each to finance the final touches to the theatre. Everyone who ‘buys’ a parquet tile will have their name, or that of someone they nominate, inscribed on the tile which will then be installed on a feature wall in the theatre as an everlasting sign of gratitude. (Please note that inscriptions are limited to 32 characters, including spaces. As reference, please use F Theatre, your initial and surname. To ease administration, the funds will be collected and ring-fenced in this account before being paid into the school account. Send your name, the number of tiles you wish to ‘buy’ and the name(s) you wish to have inscribed on the tile(s) to Ronelle who is administering the project. Her email is admin@lascaris.co.za. Hoedown host, Tracey Kirsten, with members of the Uncorked band. Tracey’s Hoedown on 13 May was a sell-out success. 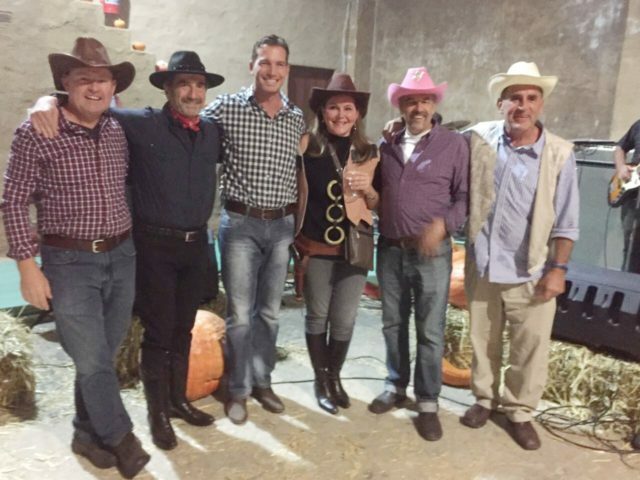 Generous Franschhoekers and their friends took up all the seats at the fund-raising barn dance held to raise funds for the Franschhoek Theatre. 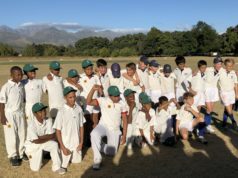 This theatre will open in the renovated and re-purposed Centenary Library of Franschhoek High School and will serve as a multi-purpose venue, including movie screenings and day conferences, while also housing the school archive. 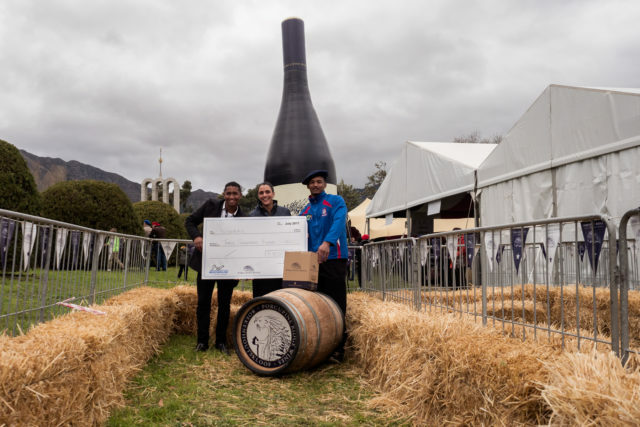 Barrel rolling champions Marchelle Johnson and Keanu Rhode in action at the DSTV Franschhoek Bastille Festival. The DStv Franschhoek Bastille Festival on 15 and 16 July, was Franschhoek’s 24th Bastille Festival. On the Saturday the weather was wet and wintery and although the village stalls were poorly patronised, rain did not stop play at the marquee. 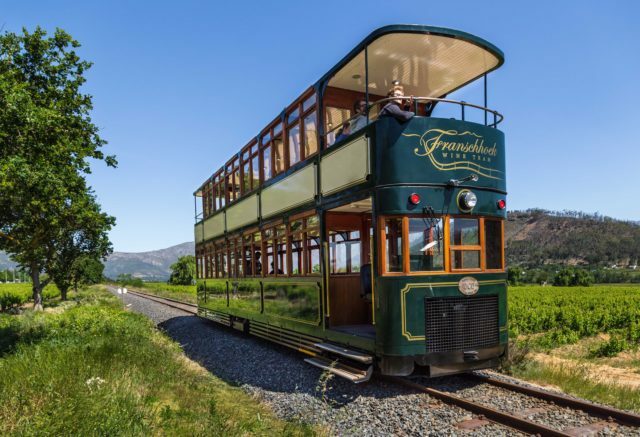 The Franschhoek Wine Tram celebrated the introduction of two double-deck railway trams at a function hosted by Vrede en Lust and the Lust Bistro on 6 November 2017. With an impressive view of the surrounding vineyards and Simonsberg mountain, guests were addressed by Dana Buys of Vrede en Lust, Hein Koegelenberg representing Franschhoek Wine Valley and Minister Anton Bredell, the Minister of Local Government, Environmental Affairs and Development Planning. Digital-savvy wine lovers have voted in the annual Vivino Wine Style Awards and reviewers have recognised Bellingham’s The Bernard Series Old Vine Chenin Blanc as one of the top 10 Chenin Blancs from South Africa. Vivino is the world’s largest wine application (app), allowing a global wine community to buy, rate and review wines. This popular wine app has more than 20 million wine lovers, worldwide, who use the app to grow, and share, their love for wine. Basil Landau’s Semillon block, planted in 1905, is one of SA’s oldest vineyards. 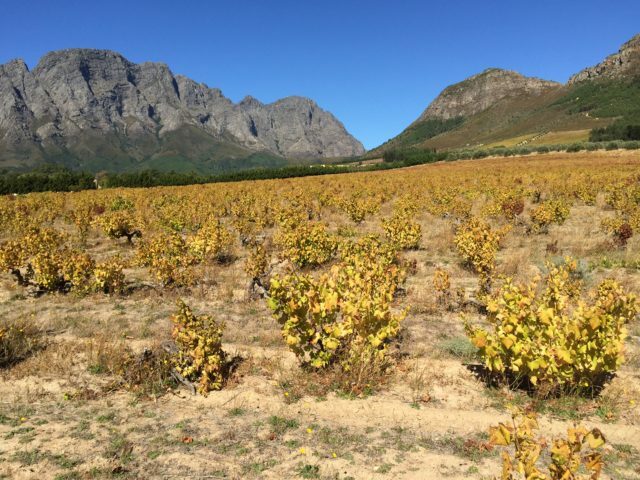 “An increased focus on South Africa’s old vines has elicited world-wide interest in the country’s wine heritage and the industry itself, with wines made from fruit sourced from these heritage vines proving their mettle,” says André Morgenthal of the Old Vine Project (OVP). He says that membership of the OVP has grown from 10 members late last year, to over 40 now, including a number of cooperative producers, with over 80% of old-vine wines represented within these systems. The rising interest in the OVP has also been seen at tastings in London and Canada, supported and organised by Wines of South Africa (WOSA), as well as locally at Klein Karoo Klassique and the US Woordfees. 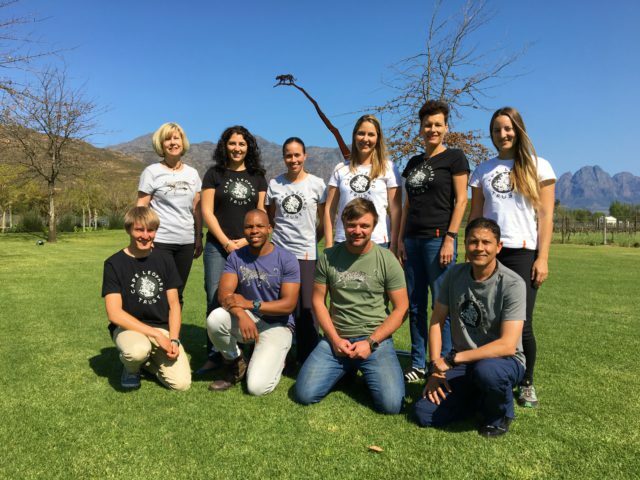 The Cape Leopard Trust team show off their new t-shirts at Leopard's Leap Family Vineyards. Spotting a leopard in the wild is a rare and special experience. A sighting apparently almost as rare is to find the entire Cape Leopard Trust (CLT) team in one place! On Thursday, 14 September, this rare occurrence actually happened, when the ten members of the Cape Leopard Trust team met at Leopard’s Leap Family Vineyards. The venue was particularly appropriate, as Leopard’s Leap is one of the Trust’s main sponsors. The reason for this unusual gathering was to bring together the usually widely-dispersed research, education and administrative teams for a group photo, and to showcase the new t-shirt range. It was also a valuable opportunity for a catch up in person rather than via Skype, and a chance to welcome the newest team member, Ismail Wambi to the fold. The stylish, new t-shirts are part of a new merchandise range that will shortly be available for sale on the CLT website as part of a green gifting campaign. The Cape Leopard Trust is an active predator conservation working group with projects in Cape Town, the Boland and the Cederberg. It uses research and environmental education as a tool for empowering conservation, finding solutions to human-wildlife conflict. 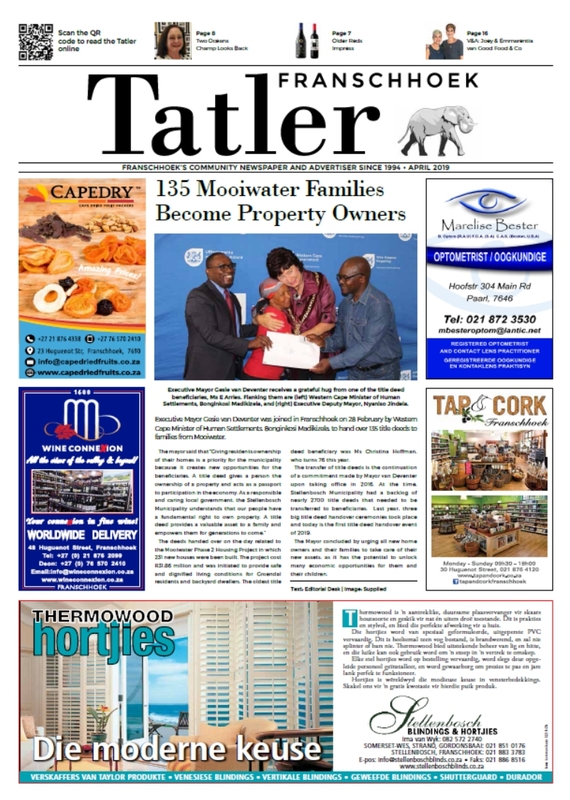 Since its inception in 2004 it has become an authority on predator conservation not only in the Cape, but also nationally. 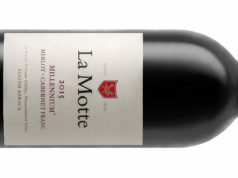 La Petite Ferme is a Cape Winelands tourism institution. 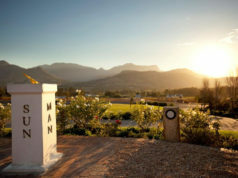 With accommodation, a restaurant and boutique winery it has been offering many a seasoned traveller the complete winelands experience. 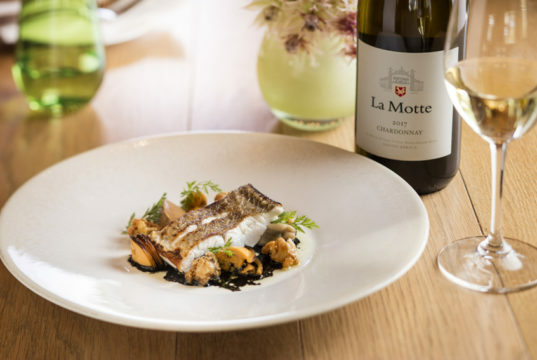 The secret behind La Petite Ferme’s many successful years is the ability to re-invent itself and keep delivering a relevant and high quality product to each visitor while still keeping its welcoming and heart-warming hospitality at the core. 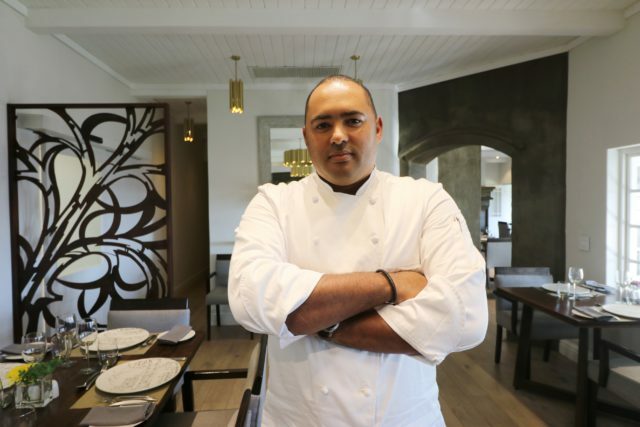 Award-winning restaurant, LUST Bistro & Bakery, has announced the appointment of Johan van Schalkwyk as new Head Chef. 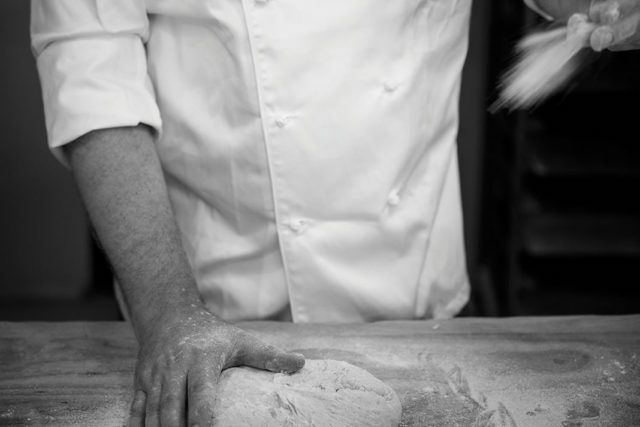 Upholding a high cooking standard, the new chef’s aim is to focus on fresh and organic produce. Mont Rochelle Hotel’s Miko Restaurant is firing up the braai for summer. Every Friday lunchtime from 12h00 they are serving up a barbeque feast. 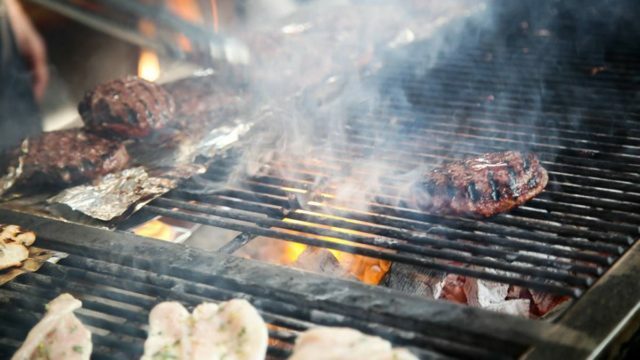 Whatever your dietary preferences there’s something for everyone: expect steak, boerewors, line fish, chicken thighs and more from the barbeque. Then help yourself to a selection of beautifully prepared salads from the salad table. 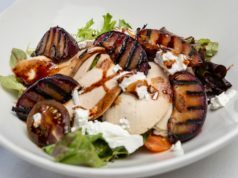 Honey roasted carrots with feta and toasted pumpkin seeds and balsamic vinegar; Baked beetroot with orange segments and basil pesto; and Grilled aubergine with feta and marjoram dressing are just three of the many options. Remember to try one of the traditional griddle cakes and to leave room for dessert! Choose from Grilled pineapple with coconut ice cream and Traditional malva pudding with Amurula cream. If you can’t make up your mind… try a bit of both! Add some wine from the farm, or a little further afield, combine with great company and you have a recipe for a very ‘lekker’ local lunch.